Is There a Way to Change Printed Output and Condense the Information Received? Unfortunately, there is nothing much to do to customize printed output of the submission. 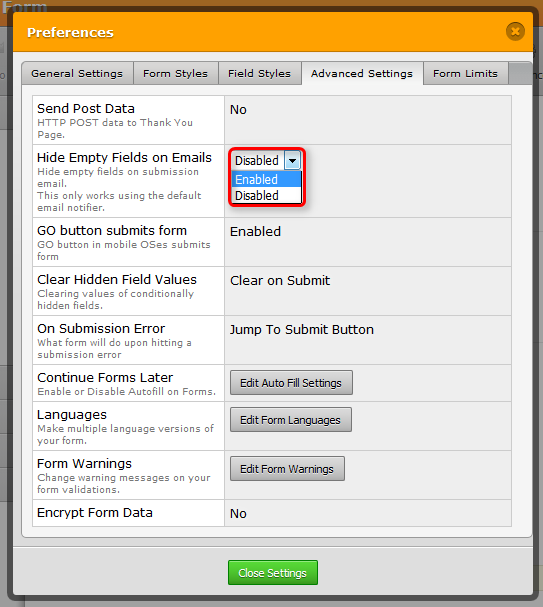 However, to shorten and condense the received submission, you can disable to viewing of unanswered fields. On the "Form Builder", open the "Prefences" and then under the "Advanced Settings" tab, you can enable the "Hide Empty Fields on Emails" option. Also, you can hide the header and header's image on received submission. To do that, you need select related form and click to "Submissions" on "My Forms". I hope this information is useful to you. For further assistance, please let us know.